Give to the Sound of Ariel. Ariel is a city of music. Children, teenagers, and seniors showcase their musical talents through a variety of choirs and music bands that perform at city events and also at international competitions. Just take a look at our “Sound of Ariel” flashmob for a look at what Ariel’s musical talent can do. To give to the music of Ariel, click on the letter “C” for “Choirs and Music” of our Ariel A to Z campaign. F ilmed at Ariel University by students of the Film/TV track of the Moskowitz School of Communication, the “Sound of Ariel” flashmob brings together a multi-generational ensemble of the city’s musical groups, including Ariel’s violin ensemble, the “Sound of the Heart” senior choir, and the Piccicata children’s choir. The Atzil Nativ-Masa program for Russian-speaking students at Ariel University have rounded out the “Sound of Ariel” ensemble with a student contingent. 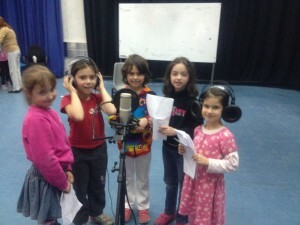 The musical track was recorded by the Sound Engineering department at Ariel University’s Design and Technology Center of Samaria. “Sound of Ariel” is a production of the Ariel Development Fund and Friends of Ariel.